Getting a short-term, business-to-business laptop rental can be a really great deal if you find yourself in need of a temporary solution. Renting a laptop may seem like an odd concept but I assure you that it is not without its merits. 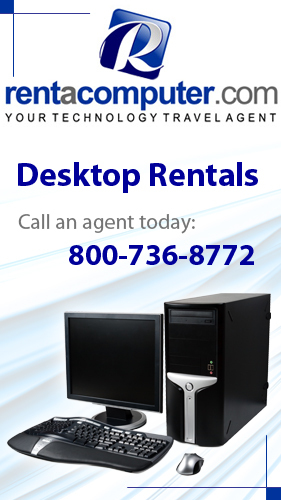 Laptop rentals are wildly popular with business professionals that are attending, presenting at or setting up a booth at an event or are traveling for an important business meeting or conference. 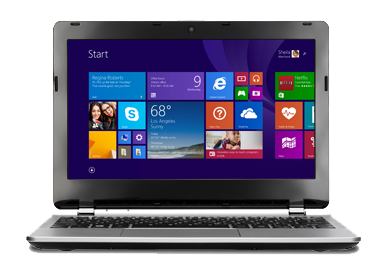 Laptop rentals allow you to have all the benefits of a top-of-the-line laptop without having to buy one! Laptop Rentals are lightweight, portable, sleek, and powerful which makes them perfect for a wide array of situations, like training classes, projects or presentations. Some people rent a single laptop for use during a business presentation whereas others rent 1,000 laptops for large training seminars or classes. I've even seen people rent a laptop to assist with tax season when an extra laptop can come in real handy. Any laptop rental you need can be customized to your exact specifications. Rentacomputer.com offers laptops with various amounts of processing power depending on your needs. If you need a quick and robust processor, then an Intel Core i7 processor will do the trick. If you only need to run a light and simple application then you may only need Core 2 Duo or Core i3 processor. If you're not sure what you need then one of Rentacomputer's Tech Travel Agents can help you decide which processor is right for your needs! Your laptop rental can also come with a variety of memory capacities as well. If you need a lot of processing power then you may need a laptop with 8GB of RAM or more. The more RAM the laptop has the faster it will perform. However, if you are only using your laptop for simple tasks, like word processing, then a 2GB or 4GB rental should do you just fine. But how much does a laptop rental cost? Well, that depends entirely on what you need. A traditional laptop rental from Rentacomputer.com typically costs $99 per day. However, there are a lot of different factors that can determine what your final cost is actually going to be. One factor is the type of laptop you need. A standard Windows Laptop Rental is usually $99. A MacBook Pro Rental is a bit more expensive at $175 and a high-end MacBook Air Rental will run you $220. But that's not all. There are 6 main factors that determine your laptop rental price: Lead Time, Specifications, Length of Time, Quantity Needed, Delivery Location, and Availability (learn more about that here). If you are in need of a temporary laptop, whether it be for a convention, trade show, event, conference, meeting, training session or a temporary replacement for your personal laptop then a laptop rental is a pretty smart bet! Rentacomputer.com offers local delivery and installation anywhere in the United States and their professional Tech Travel Agents will work with you every step of the way to ensure that what you're getting is exactly what you want and need!